Thursday 27th September 2012 gave Gowrings Mobility the chance to celebrate their unique heritage, demonstrate their flexible new factory, educate some local special students, inspire their employees and share their special relationship with Paralympian Silver Medallist Karen Darke with family and business customers. Arriving in style in a chauffeur driven Gowrings Mobility Doblo SpacePlusTM wheelchair accessible vehicle, Karen Darke was greeted by John Newman of the Newship group that own Gowrings Mobility. Karen pulled the cord and the official part of the day was completed with cheers, smiles and party poppers! “Having a permanent home for Gowrings has meant that we can invest in plant and equipment and a new layout that streamlines the production processes. Production is now more flexible for the future and new models such as our SpacePlus Doblo and new-design Movano have been quickly introduced into this new environment. 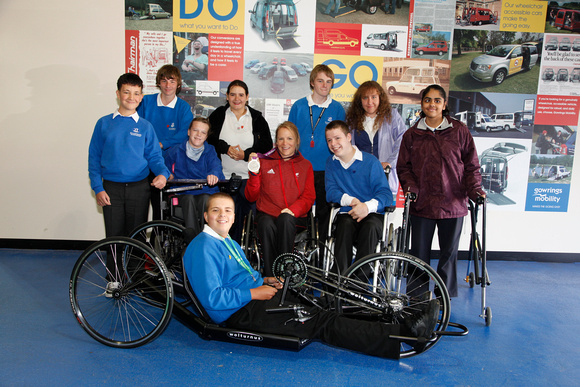 Nine pupils from Brookfields School in Tilehurst in Reading, were delighted to be invited to visit the new factory and to meet Karen and have a go at hand cycling – Karen’s Paralympic sport. The children, all of whom have special educational needs, were delighted to see, touch and even wear Karen’s silver medal and asked her lots of questions about her achievements. After waving goodbye to the excited students, who had brought along London 2012 Paralympic flags, Karen was whisked off for an informal lunch at the Regency Hotel with some key members of staff and business customers. “I really enjoyed meeting some of the Gowrings Mobility customers, and learning about how their vehicles have improved their lives. I strongly believe that personal mobility is really important so to be working with Gowrings Mobility this year is a great honour. It was a pleasure to meet the Gowrings team, from management to hands-on roles and to see how customers and good customer service drives this business.